This statistic shows the results of a survey regarding U.S. physicians' median compensation in 2013. 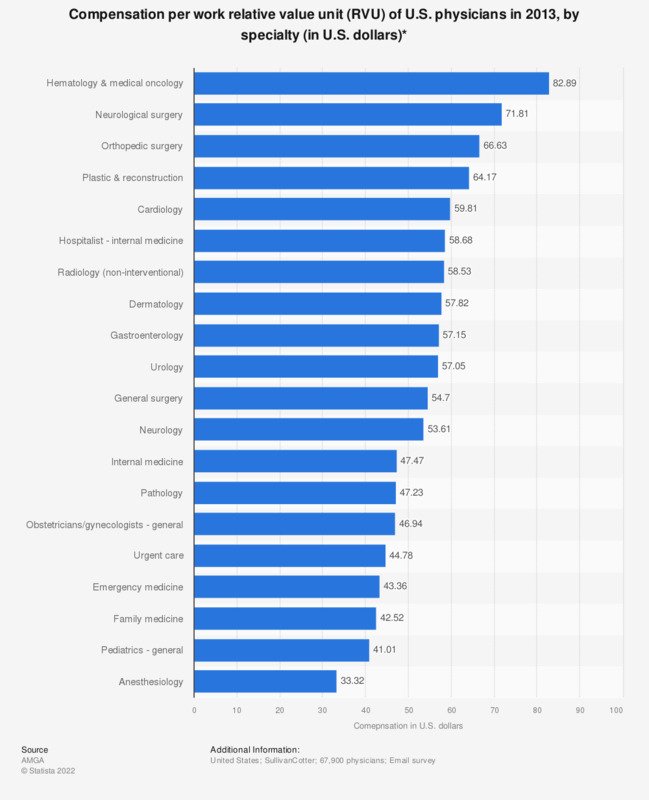 It shows the compensation per work relative value unit (RVU) of U.S. physicians in 2013, by specialty. In that year, family medicine physicians in the United States reported a median compensation of 42.52 U.S. dollars per work RVU. Physicians' compensation in the U.S.
Hematology and medical oncology physicians received 82.89 U.S. dollars as compensation per work relative value unit (RVU) in the United States in 2013, one of the highest compensated physicians. However, physicians working in this field tend to work less compared to their compatriots, working an average of 4,630 RVUs. Physicians in neurological surgery received 71.81 U.S. dollars per RVU while pathology physicians received 47.23 U.S. dollars per RVU. Neurological surgeons also worked an average of 9,493 RVUs. Physicians in psychiatry and surgery are some of the most common specialties in the United States, accounting for 50,849 and 48,735 physicians, respectively, in the country in 2015. Hospitals also reported using various discretionary compensation or incentives for their physicians. About 46 percent of hospitals in the U.S. referred to patient satisfaction and 28 percent of hospitals referred to successful clinical outcomes as incentives for employed physicians. Pay received by general practitioners and primary care physicians are generally lower than that of specialists, which has increased the number of specialists in the country. Compensation for many physicians does not reach the same rate of return on medical education than those who pursued a law degree or an MBA. In the United States, physicians in diagnostic radiology charged a median of 2.37 million U.S. dollars.